The “silent protagonist” is a video game trope almost as old as video games. Ironically, one of the first silent protagonists would also set the template for most video game personalities to come. Mario, perhaps the most iconic video game character ever, was originally Jumpman (and before that “Mr. Video”). The only personality this proto-Mario had was based on the classic “hero, girl, brute” love triangle of Popeye. His identity as a working class hero was created largely as an accident. Nearly all of the iconic details that describe him to us as a working class man were added due to the graphic constraints of early arcade machines. His overalls were created to help differentiate his arms when moving, his mustache was added to indicate a mouth without excess pixels, and his hat simply to avoid having to animate hair. As more details were added for the sake of graphical convenience, the developers couldn’t help but begin seeing motivation and agency appear. Now that their nameless Jumpman was someone with a uniform and distinct facial features, he was no longer an empty vessel. 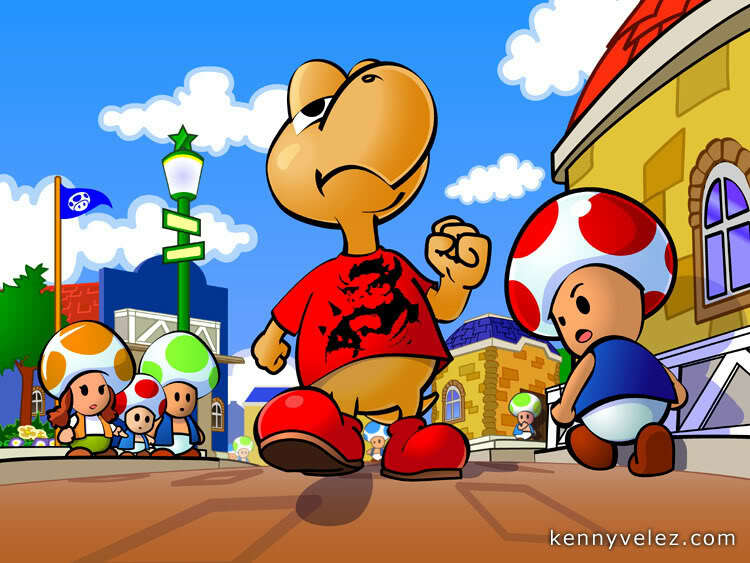 He was given the name Mario in “honor” of Nintendo’s warehouse landlord, and he became the Mickey Mouse of video games. His job was originally a carpenter, and when colleagues suggested he looked more like a plumber he was placed in the sewers beneath New York for his next arcade game, eventually setting the tone for his most famous adventures. Interestingly, the story of Jumpman’s creators giving life and agency to him as Mario is not dissimilar to the experience the player has. Most silent protagonists, especially in role-playing games, are empty vessels. A collection of simple, lowest common denominators to make them as quickly appealing to as many of the target audience as possible. While the audience rarely get to actively create their character or define them visually in the same manner Jumpman became Mario, nearly all games provide some sort of cues which lead the player to develop a sense of identity for the character. Understanding how uniforms and icons shape our preconceptions is an important part of analytical theatre. Imagine a scene where one man has a gun pointed at the other. What are they wearing when you visualize this scene? How did they get into this situation? Now imagine the exact same scene, only the man with the gun is wearing a police uniform. How has this change influenced the narrative? What if the hostage was in a police uniform and the man with the gun dressed as a Hamburglar-style robber? As much as we wish we were all individuals, the truth is that our actions are shaped by our identities. How those actions are perceived by others is, in turn, shaped by how others perceive our identities. No character acts as solely an individual, but also as a member of their class and culture (or what others presume is their class or culture) as well. These uniforms take on similar roles as that in theater. Taking the exact same gameplay but replacing Mario with another character such as Sonic (an anthropomorphic animal designed to combine 1930s Mickey Mouse with 90s era radical excess), Bonk (a caveman with an expression of amused befuddlement occasionally punctuated by psychotic rage) or Wario (a sinister and slovenly replica of Mario looking a bit like a working class hero who lost their job and took to heavy drinking) can completely change the theme and even the morality a player experiences. Games can take advantage of this fact to subvert expectations or to encourage the player to consider what perspectives they bring when evaluating certain icons and uniforms. There are very good reasons for us to evaluate how and why cultural icons and uniforms shape our perceptions. Look at a program like the NYPD’s Stop and Frisk which targets “suspicious” people. The icons that define “suspicious” to the NYPD end up disproportionately targeting minorities. Not only does this reveal institutional racism, but it also serves to be a completely ineffective tool for tackling issues of drug use. Innocent people are detained and harassed because of a bias, while actual root sources of the problem are ignored. At the same time, those biases see an institutional confirmation and are perpetuated in the face of actual data. Recently the program has been used to harass women, with “provocative dress” being probable cause to stop and search someone, and then finding a condom on them being evidence enough to arrest them for prostitution. We see the same attitude happen in regards to how the harassment, surveillance and detaining of American Muslims does nothing to deal with or stop domestic terrorism and yet, many Americans have no problem stripping away the rights of others (and especially non-Americans) because this bias provides an illusion of safety. This tendency towards extreme confirmation bias may have served our ancestors well when they were dumb apes* who needed to make split second decisions on if an animal, location or potential food source was dangerous or safe. But make no mistake; I am not making the case of some amateur evolutionary psychologist attempting to justify their own biases. An aspect of human psychology having a biological or evolutionary origin does not make it moral, accurate or even useful. If stereotyping and bias really is hardwired into human behavior, a premise I do not believe, then it means we must make every effort to fight against this harmful, distracting process within our own minds. When I speak of uniforms and how they define our ideas of an individual, there is one game series that immediately comes to mind. The job system of Final Fantasy is a perfect example of a number of uniforms created to convey an individual’s role and attitude to the player. People new to video games might not have any idea what a Red Mage is, but anyone seeing that simple sprite could make a fairly accurate guess as to what kind of hero they are. While the jobs are static in the first game, they become more fluid in later entries to the series. There the jobs actually do become uniforms that your characters slip in and out of. You want to be a knight? You have to wear the armor. You want to be a wizard? You gotta put on the robe. This should all seem fairly obvious after what we’ve just looked at, but there is one Final Fantasy game that takes the concept of uniforms and icons further than the others and opens the door for some very interesting analysis. Final Fantasy V is considered by many rpg aficionados to be the peak of the series’ job system. Your party of four characters obtains a vast amount of jobs to choose from, each with their own uniforms. But unlike the past games, where your characters would look identical if they had the same job, the characters of FFV have their own ideas on each job. 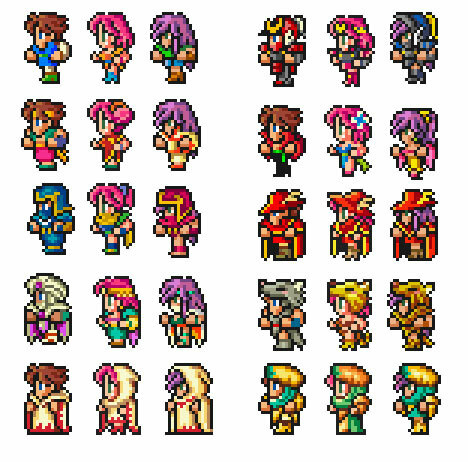 Most of the cast of FFV is fairly one-dimensional. Heroic Butz is defined almost solely by his love of travelling. Leena is defined as the one who has the most feelings. Galuf is defined by having amnesia and being older. His daughter Cara is pretty much just a version of Leena with more animal friends. The most interesting character is Faris, an orphaned princess raised as a man by pirates and uncomfortable with her own femininity. She’s not coded as homosexual or heterosexual, nor as transgendered, but rather as genderqueer. Anyone who is actually genderqueer can feel free to tell me I’m off base of course, but Faris doesn’t seem to personally identify as any particular gender. Rather, Faris seems willing to operate under whatever label others give her while personally identifying herself her own way. Despite having different personalities, the characters all start out nearly identical in terms of statistics and any one of them could be used in any of the standard rpg party roles. Every character has their own slightly different variation of each job’s outfit, and while most of them follow the same themes or are divided along normal gender routes, Faris is the exception. While Leena wears slinky dresses as a Monk and standard anime-style outfits as a Ninja, Faris wears a gender-neutral gi as a Monk and as a Ninja wears a helmet and armor closer to Butz’s. Other jobs, such as the Mystic Knight and the Dancer, feature Faris in more traditionally feminine clothing. Since we know Faris identifies neither as a man nor a woman, what do her choices say about her character? When we compare them to Faris’ uniforms, what do the other characters’ uniforms say about them? When we choose which jobs to give Faris, what does this say about us? Once we consider this, what does this say in turn about the jobs we have chosen for the other party members? Of course, I’m not suggesting that the team behind Final Fantasy V intended to create a game that challenged our assumptions on gender, nor that they intended the game to serve as a tool for self analysis. In fact, the most recent English translation of the game (there were two official translations and at least one unofficial fan-translation) goes out of its way to assure us that Faris is a woman and only wears men’s clothes for convenience and protection (and I don’t know enough Japanese to comment on if the original translation has the same intent). Its safe to assume their primary motive was to make a lot of money and a fun game. But in art, as in life, intent is not very relevant. Knowing an artist’s intent can influence how we perceive the work, and the artist’s intent may have influenced how they used certain tools or mediums, but once the game has been shipped and the player reaches the title screen the meaning and value of the game is out of the artists’ hands. The meaning that comes from the game is a synthesis of the artist and the player. An idea like Video Games of the Oppressed is not solely about rethinking how we make video games, but also rethinking how we play video games. * This is not entirely fair to our ape cousins of course. Studies have shown that young chimpanzees are in fact better at adapting to new information and critical problem solving than young humans. Ouch, maybe we can’t blame as much on our common ancestor as we’d like to. This entry was posted in Video Games of the Oppressed and tagged Final Fantasy, Gender, jrpg, Mario, Theater of the Oppressed, Video Games of the Oppressed. Bookmark the permalink.